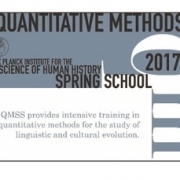 We’re delighted to announce another outing for the Spring School on Quantitative Methods at the Max Planck Institute for the Science of Human History. The recently-opened (2015) Institute is located in Jena, Germany. Further information, including the application form, is at the MPI-SHH website. Applications close January 20th.